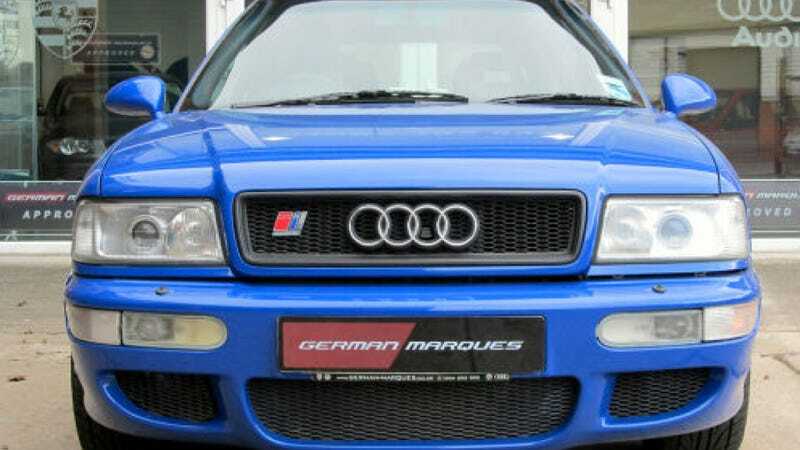 How Much Would You Pay For An Audi RS2? What I wouldn't do to live in the UK. I mean, Big Ben is historic and whatnot, but if I were there I could be the owner of this stunning Audi RS2 Avant for 14,000 of my British pounds. Outstanding. Forgive me if I have a little too much of a car crush on a wagon based off of an Audi 80, but the RS2 has a kind-of-awesome heritage. This is the original "RS" car. Starting in life as a collaboration between Audi and Porsche, it was given a turbocharged five-pot as a heart that pumped out 311 horsepower – and this is in 1994. Underneath is the Quattro system, of course, hooked to a six-speed manual with an interior fitted with Recaro seats. It was also built in the same plant as the Porsche 959, which is also kind of cool. This killer blue example is one of just 180 of the 2,800 RS2s built in right-hand drive. This one has done 142,000 miles but the owner clearly loved it. It was traded in for a Porsche 993, which is also cool. This is a wagon, so it's cooler. This one is listed at £14,000, which is about $22,000 in the U.S. I can promise you it could probably go for a lot more than that. Tell us — how much would you pay for one?